The 9th Cloud Control Workshop is held at the small conference venue called Friiberghs Herrgård, by the Mälaren Sea. The format of the workshop mimics that of the successful 7th Cloud Control Workshop. The 9th Cloud Control Workshop is aimed to foster multidisciplinary research in cloud management, leveraging expertise in areas such as autonomic computing, control theory, distributed systems, energy management, machine learning, mathematical statistics, performance modeling, systems management, etc. By providing an understanding of the research challenges ahead and by fostering multi-disciplinary research collaborations, the ambition is to shape the future of cloud management. Expected attendees are leading researchers from any scientific discipline with potential to contribute to this multidisciplinary topic. The workshop format will be to mainly focus on multi-disciplinary research discussions in parallel sessions but also include some short scientific presentations on planned, ongoing, or completed research. Participants are encouraged to propose discussion topics beforehand and to take active part in any discussions with the ambition to make progress on any topic of interest to the participants. The 9th edition will strive for a strong focus on cloud management using the techniques listed above, rather than on cloud in general. The format will to a large extent resemble the format of the 7th edition. Hence, there will be no papers and no proceedings, but plenty of time for presentations and discussions among an interesting and multidisciplinary group of researchers from academia and industry. The workshop presentations include some keynotes, invited short presentations, very short presentations by young researchers, and a substantial number of longer discussion sessions (typically held in 3-way parallel session). An important part of the meeting is also the opportunity to informal discussions in a nice atmosphere, with all participant at the same place and not many other people around. For an example of the program, see the Program of the 7th edition. Docker is shaping the cloud industry with its container technology. It is helping developers build microservices, move them on the cloud and manage them through the entire DevOps lifecycle. Containers also help cloud providers gain visibility into applications. Transparency of images and containers allows the cloud provider to ensure applications are executing in a secure manner, adhere to compliance rules, and are handled by the cloud management system appropriately for the workload type. A container cloud, where a container is a primary means to deliver applications and virtualize infrastructure, offers an unprecedented opportunity to deliver simplification of management without the loss of flexibility—a game changer, indeed. To capture this opportunity many challenges have to be addressed from platform security and operational efficiency to workload-centric analytics and optimization. Malgorzata (Gosia) Steinder is an IBM Fellow and Distinguished Research Staff Member in IBM Research leading work on container-native cloud platforms. During her career has worked on several interesting projects in the area of cloud, virtualization, and middleware, all centered on the goal of automating the management of workloads and systems. Several of these projects led to IBM products and services. Gosia holds over 20 patents and authored over 60 publications. She served as an associate editor of TPDS, TNSM, and JSNM, and as a chair of software engineering track of WWW. She has doctoral degree from University of Delaware, and masters degree from AGH Technical University in Krakow, Poland, all in computer science. As computing has moved to the cloud, the tradeoff between performance, availability and cost has become increasingly complicated. Distributed cloud based architectures are complex, nonlinear, stochastic and time-varying, and are often inherently unstable under heavy load. Companies that move to the cloud need to maximize performance subject to constraints on availability and cost. This presentation surveys some of the challenges involved in designing and operating micro-service cloud systems, and explores constraints to their stability and efficiency. These constraints will be illustrated with examples drawn from Netflix and Life360. Simon Tuffs began his career in computing by researching self-tuning control systems at the University of Oxford. He then moved into the software engineering industry and has held a wide range of positions developing and deploying commercial distributed systems at scale. His current role is leveraging analytics and feedback to real-time big-data services in the cloud. The workshop will take place at Friiberghs Herrgård, by the Mälaren Sea. This is a small venue at a beautiful location that will provide not only excellent conditions for the workshop sessions but also a relaxed atmosphere for further discussions or outdoor activities during the long summer nights. Bus leaves Arlanda Airport at 9.00 on June 27. Gathering immediately outside the exit of Terminal 4 at 8.40. Bus arrives Arlanda Airport (Terminal 4) at 17.00 on June 29. We strongly encourage to take part from the very beginning to the very end, but in case the bus times does not fit your travel schedule, we recommend reserving a taxi from Bålsta Taxi to ensure finding a driver that knows the way (phone +46 171 50049). Costs for conference facilities, joint bus transfer to and from airports, etc, is covered by the workshop organizers. 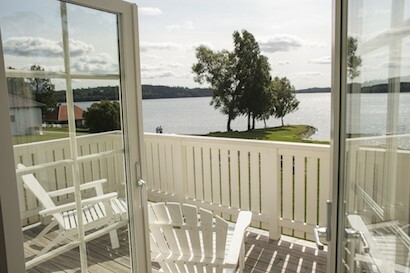 Although we expect the venue to make discussions last into the bright summer nights, we recommend also other outdoor activities including to use the sauna and relax facilities by the Sea. Other activities includes canoes, rowboats, tennis, and outdoor social games.